We will survive this first week of sending Lola to daycare. Throughout the week, she continued to wake up every 1 1/2 - 2 hours. Things started getting a little better last night. She actually slept for 5 1/2 hours and it was fabulous. She also started eating well again and she seems to be back to her old self. What a relief! Due to the sleep deprivation early on in the week, there were also tears but we continued to stay positive knowing this is just an “adjustment period”. “Babies are very perceptive. Even when they are still in the cooing stage of language development, emotionally they are very sensitive and smart. When you return to work, your baby feels that the world of security and comfort she was just getting really well acquainted with is now topsy-turvy”. “Your baby may also wake at night when you go back to full-time employment, even when she has already begun to sleep through the night sometimes. This waking is another signal of your baby's emotional intelligence. She knows that at nighttime, if she wakes and needs attention, her beloved parents will be there for her”. How sad is this. She was waking up at night to feel a sense of security. This brings tears to my eyes just thinking about it. These are the things that no one tells you. I wonder why? Through my research I haven’t been able to determine exactly how long it takes for a baby to adjust. Does anyone know? They did say to take a blanket with your scent on it and ask the teachers to wrap her in it when she sleeps and eats. I just don’t want baby Lola to feel like we've abandoned her. Obviously, that is not the case as she is the love of our life. Clay was suppose to go on a boys kayaking trip this weekend. He decided to stay home with us as we adjust during this new phase. He is such a great father. There is nothing better than a daddy’s love for his daughter. 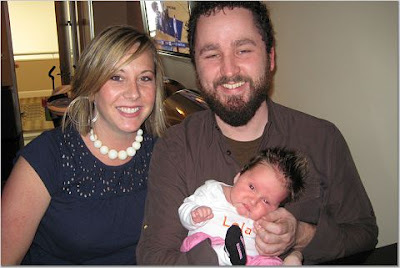 Attached is a picture of us at Lola's first Stars game. I think she was right around 7 weeks old. She is a little nugget. P.S. Yoga was so exhilarating last night. I was skeptical about the hot rooms but it was fabulous!!! I highly recommend everyone give Sunstone Yoga a try.